I love muesli … it fills me up just the right amount in the morning, and if I eat it with some yogurt and fruit I feel like I am starting the day with a real treat. I grew up eating home-made muesli – I never like boxed cereals much. Those bricks made out of wheat that turn into mush the moment you add milk to them make me want to vomit. Nutri-Grain was a favourite, but not a regular feature in our household because of the sugar content. And besides there are so many reasons to avoid cereal – cereal is really expensive, doesn’t fill you up, leaves your teeth coated in sugar, gives you an energy high that then plummets about 2 hours later, is fortified with minerals that can’t be absorbed properly in that state and one box just doesn’t last very long! There has even been some unpublished studies suggesting the cardboard box has more nutrients than the cereal – but I believe Myth Busters busted that one, except just because something will keep you alive for a while doesn’t mean it’s good for you. It is super-easy, super-cheap and super-quick to make your own muesli, and you know exactly what the nutritional content is. 2) Take half the mixture and whizz it all up together in the food processor until it is quite small, then add back to the bowl. 3) sprinkle over some cinnamon. 4) Add 2-3 tablespoons of coconut oil and mix it all together really well. Eat it with homemade yogurt and fresh fruit. It is also great as a topping for desserts, and as a crumble topping for stewed fruit too. I’m still not clear as to whether all seeds need to be soaked to increase their nutrient absorption. It is good for nuts and grains to soak them for at least 8-12 hours so that the phytic acid breaks down and our bodies can more readily digest the beautiful goodness inside, but I am not sure about seeds. I believe that toasting seeds help break down the phytic acid in seeds. As soon as I buy my nuts I soak them overnight in water with a bit of whey or vinegar or lemon juice added to it, then I dehydrate them for 12 hours. Sounds like a lot of effort, but if it becomes part of your rhythm in cooking then it isn’t at all. When you notice you are running low on soaked nuts, then that night you start soaking the next lot. This process makes the nuts and grains crispy and crunchy. I find almonds taste so much nicer when they have been soaked and dried – they lose their bitterness. Soaked and dried hazelnuts are something else. Addictive. So for the soaked grain-free muesli, which is an idea I haven’t made yet, I plan to prepare the mixture above up to step 3 and then mix it all up in some yogurt and leave it overnight (or all day if I remember to make it in the morning!). 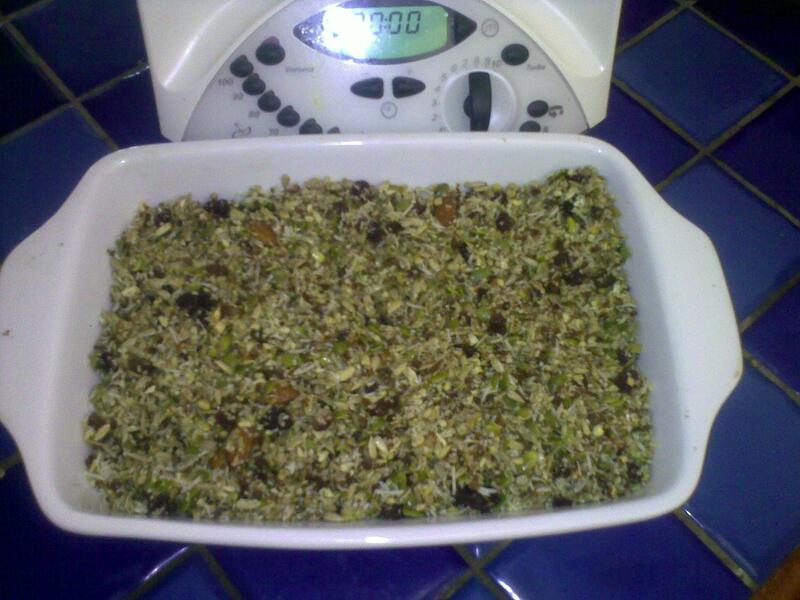 Then it can be turned into a granola by putting it in the dehydrator or in the oven on the lowest setting until it is all dried. I’ve made granola with oats this way before, and it is delicious. Great as a snack or a trail-mix too. You have to break up the clumps every now and then so it dries evenly. The reason you dehydrate it, or cook on the lowest setting is so that you retain as many active nutrients as you can in the ingredients, especially in the yogurt, which has so much probiotic goodness for your digestion.